A new nose, a new front differential, and a button on the dash that says "Tarmac." 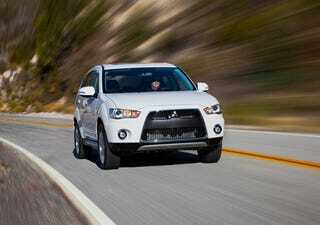 Is the 2010 Mitsubishi Outlander GT the Lancer Evolution of SUVs, or just another… er… pretty face? Full Disclosure: Mitsubishi flew us out to Palm Springs and put us up in a swanky hotel so we could bring you this review. Palm Springs was full of old "new" people, new "old" people, hip people, and old people with new hips. Our hotel was full of nifty fake cheetah fur and fizzy drinks. Also, we went to a bar where Liberace once hit on everyone. It was fun. No, you're not seeing things –- that's a Mitsubishi Lancer's snout tacked onto the nose of a seven-passenger truck. This is the 2010 Mitsubishi Outlander. Do not adjust your screen. We know what you're thinking: That is one big nose job. In the industry, this sort of thing is known as a mid-cycle face-lift, a planned rejuvenation that occurs roughly halfway through a vehicle's production life. In these face-lifts, cosmetic updates are usually paired with a handful of mechanical and electronic refinements; the goal is to give sales a small boost and retain interest in the model until its replacement is ready for sale. But enough with the background. We mention all of the above only so we can tell you this: Rarely is a face-lift this extreme. In one fell swoop, the Outlander has made the jump from relative nonexistence to something else entirely, something both polarizing and compelling. (Go ahead: Try and remember what the 2005-2009 Outlander's nose looks like. Five bucks says you can't.) It's like John Travolta's shift in Pulp Fiction –- at some point during that dance with Uma Thurman, Vinnie Barbarino began to matter again. And somehow, by borrowing a face, Japan's most anonymous SUV became interesting. Also, Mitsubishi gave it an updated interior, the aforementioned differential, and ten more horsepower. We have thoughts on all of this. This is one of those things that's entirely up to taste. The last Outlander suffered from anodyne looks and a wallflower vibe that encouraged parking valets to mistake it for a turkey sandwich. The truck you see here is as extroverted as its predecessor was sleepy; the gaping hole in its maw is either a killer shout-out to the Evo's rally heritage or a tribute to the everlasting glory of the Mississippi River catfish. We like it, but we also like bourbon milkshakes and playing the music of John Philips Sousa very loudly at three o'clock in the morning. We acknowledge that such things are not for everyone. Your call. All told, the end result is something that sneaks up on you. The Outlander will hustle down a country road or blaze down a freeway with surprising speed, but it doesn't have any interest in throwing its talents in your face. Items of note: a 710-watt Rockford Fosgate stereo with a ten-inch subwoofer in the trunk; a sunroof; an optional navigation system. The stereo can store songs on its internal hard drive, and there are iPod and video jacks in the center console. Given the price point, this is a respectable, but not remarkable, amount of icing. At $29,990, the Outlander GT is almost three grand more than the base Outlander ($27,130). Neither is a bargain, and both feel a bit too expensive for what they are. It's kind of like eating out in California if you're from the Midwest –- the food is generally pretty good, but you can't shake the feeling that there's a better deal just down the street. A good SUV, but not a great one. That said, the GT is a more well-rounded truck than the base Outlander, and it's definitely worth paying a premium for. On top of that, the competition — specifically, the offerings from Nissan, Hyundai, and Ford – isn't anywhere near as much fun to drive. This is what you buy if you have to have a mid-size crossover and don't want to spend a lot or drive an appliance. It'd be nice if both this and the regular Outlander were a bit cheaper, but you can't have everything. Suitability Parameters: Who Should Buy This? Suitability Parameters: Who Shouldn't Buy This?